When you first meet Melissa Ellefson, her smile radiates from the next room. 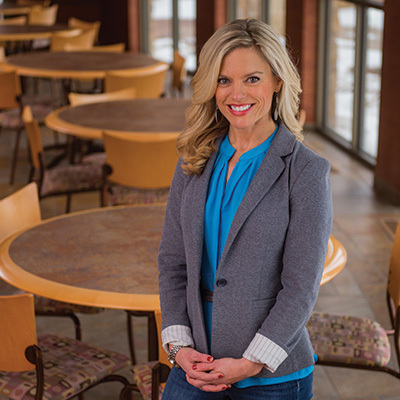 Fit and personable, the 41-year-old South Dakota native exudes what it is to be healthy. Her constant energy, passion and gratitude for every aspect of her life can turn even the biggest couch potato towards a leafy salad. And did I mention she leads one heck of a High Intensity Interval Training Class? As the first Director of Wellness for POET, Ellefson’s dedication is focused on team member overall health. She not only wants the team to be physically healthy – but mentally, spiritually, and emotionally healthy, too. A graduate of the University of South Dakota with a Bachelor of Science Degree in Health Sciences Ellefson came to POET in July. “It was really a God thing how I ended up working at POET,” she says. cancer. He was told that without treatment he would have approximately eight months to live. With aggressive treatment, Matt faced a five year survival rate of less than five percent. Remember, this was almost exactly five years ago. a few bumps in the road and three recurrences, Matt blew that five percent chance out of the water this New Year’s Eve. So when Ellefson talks about gratitude being an important component of wellness, she means it. And through her emails and tips on fitness, nutrition and spiritual well-being, there isn’t a better person to help them achieve this goal.